When Rosemary Little was 12-years-old, she contracted a form of autoimmune encephalitis, causing idiopathic spastic quadriplegia and generalised dystonia. This meant that she had to relearn all of the skills she had developed up until that point, and has no memory of her life between the ages of 12 and 18. After attending a Wheelchair Sports NSW ‘Come and Try’ day in 2003, Rosemary began competing in wheelchair racing but devastatingly, was 0.02 seconds short of qualifying for the 2004 Paralympic Games in Athens. Following this defeat and a bout of illness, she took a hiatus from the sport and did not return to it until the back end of 2011. In 2011 Rosemary endured another setback when she competed in the City2Surf and collided with another athlete, severely damaging the right disc wheel of her chair. She had to raise the $8,000 required to purchase a new one before she could continue her preparation for the London 2012 Paralympic Games. 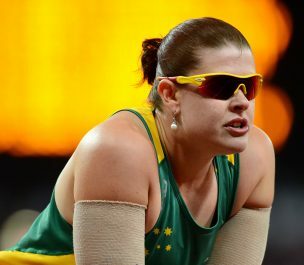 During the 2012 Australian athletics season, Rosemary competed on the annual Summer Down Under wheelchair circuit, setting new world records in the 100m and 200m, and cementing her place on the team headed to the London Games. Guided by her coach, nine-time Paralympic gold medallist Louise Sauvage, Rosemary won bronze at the Games, a performance which ranks among her greatest sporting moments to date. At the 2013 IPC Athletics World Championships in Lyon, France, Rosemary’s efforts to improve were palpable. Despite the spasms in her hands affecting her performance over short distances, the Australian and Oceanic record holder collected silver and bronze medals in the 200m and 100m finals. Rosemary was again selected to represent Australia at the IPC Athletics World Championships in Doha, Qatar in 2015, and was looking forward to toppling reigning European champion and current world record holder, Hannah Cockroft, but was admitted to hospital before competition began. The West Pennant Hills local has also represented Australia in handcycling and achieved a qualifying time in rowing. She is working towards completing a degree in occupational therapy at the University of Sydney and holds an ambassadorial role with The Hills School in Northmead. Rosemary also helps people with disabilities learn to live independently. Invacare Australia and New Zealand supplies her equipment in an effort to help her to realise her dream of Paralympic gold.